Stepping onto the ancient Machu Picchu ruins in Peru, Cal Poly graduates Josh Holland (B.S., Graphic Communication, 2012), Aaron Rivera (B.S., Computer Science, 2012) and Mark Paddon (B.S., Computer Science, 2012) felt awed by its historical magnitude. Inspired, they wanted to understand what the ruins might have looked like to the Incan inhabitants, including the daily rituals, sights and sounds. Guidebooks were informative, but took them out of the experience. They wanted a knowledgeable guide to put them in the picture, a “sidekick” who could tell them a fascinating piece of information right when and where they needed it. would have looked like pre-1966. 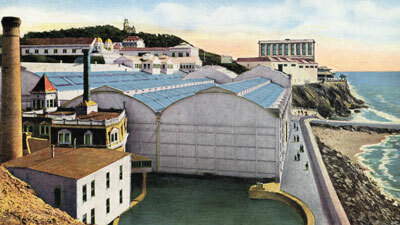 postcard of the Sutro Baths in their glory days. The team moved quickly. Back on the Central Coast, they began developing a mobile app dubbed “Guidekick.” By December 2013, the trio completed the first iOS Guidekick site, Hearst Castle, connecting travelers with historical sites through interactive maps, videos, photos and narrative. “We didn’t want to just tell the story — we wanted to immerse someone in it, as though they’re standing at the historical location and everything is happening around them,” Holland said. As visitors move around the historical sites, the app tracks their location, offering different ways to understand their surroundings. Guidekick helps users see where they are spatially in the site and offers additional relevant information, enriching an intimate view of history with audio, video and visual narratives. The app, for example, helps visitors to the Sutro Baths in San Francisco visualize beyond its ruins by enveloping them in the sights and sounds of the Baths’ golden years. Built in the late 19th century, the Baths was the largest indoor swimming pool facility available to the public in the Bay Area before it burned down in 1966. 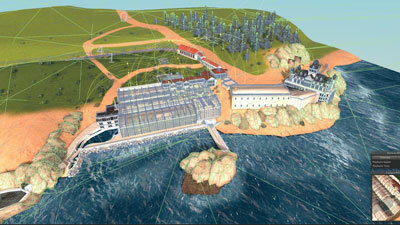 Currently the app supports the sites of Alcatraz, the Golden Gate Bridge, Golden Gate Park, and the Sutro Baths & Cliff House. The team plans to expand beyond California’s Bay Area to sites all over the world, changing the way people use modern technology to experience history. Since the Guidekick app was launched, the Hearst Castle experience has received rich praise, including iTunes’ “Best New App” and a top-10 ranking in Best Paid Travel apps.